Barges used to make up a large percentage of England’s boats. Used to haul pretty much everything up and down the interior waterways of the UK, the bottoms of these flat boats would be filled with ballast (rocks, earth, etc) to weigh down the vessels when they docked. This ballast was often dumped, leaving behind large quantities of plant seeds, many non-indigenous, that were preserved in the river beds. Turns out “ballast seed” stays preserved pretty well. 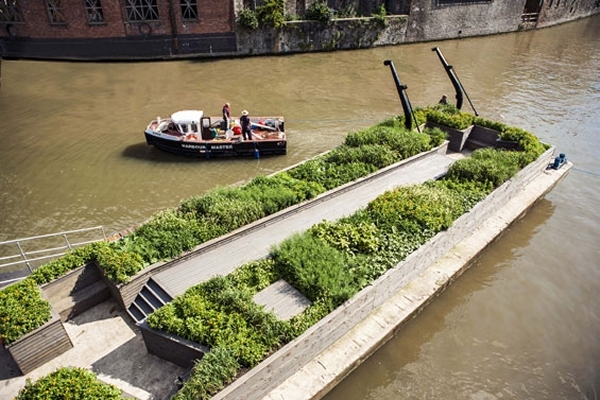 So well that designer Gitta Gschwendtner and artist Maria Thereza Alves have created this floating garden on an old barge in Bristol England, made entirely with non-native seeds dug up from English riverbeds, creating an interactive and natural bit of history. The Ballast Seed Garden is located on Bristol’s Floating Harbour. Full story at World Landscape Architecture. Discovered via Messy Nessy Chic.